For the American B-Western actor, see Wild Bill Elliott. For the American musician, see Bill Elliott (musician). Elliott administers the Oath of Enlistment to a U.S. Navy sailor on October 21, 2005. Statistics current as of November 17, 2018. William Clyde Elliott (born October 8, 1955), also known as Awesome Bill from Dawsonville, or Million Dollar Bill, is an American professional stock car racing driver. He last competed part-time in the NASCAR Xfinity Series, driving the No. 23 Chevrolet Camaro for GMS Racing. He won the 1988 Winston Cup Championship and garnered 44 wins in that series, including two Daytona 500 victories in 1985 and 1987 and a record four consecutive wins at Michigan International Speedway between 1985 and 1986. He holds the track record for fastest qualifying speed at Talladega at 212.809 miles per hour (342.483 km/h) and Daytona International Speedway at 210.364 miles per hour (338.548 km/h), both of which were set in 1987; the mark at Talladega is the fastest qualifying speed for any NASCAR race ever. Elliott won NASCAR's Most Popular Driver Award a record 16 times. He withdrew his name from the ballot for that award after winning it in 2002. In 2005, Georgia Governor Sonny Perdue declared October 8 as Bill Elliott Day in the state of Georgia. He was inducted into the Motorsports Hall of Fame of America on August 15, 2007 and into the 2015 class of the NASCAR Hall of Fame. Elliott has also been honored by the state legislature with a stretch of roadway (the entirety of Georgia 183) in his native Dawson county renamed Elliott Family Parkway. William Clyde Elliott was born in Dawsonville, Georgia on October 8, 1955. According to his autobiography, many generations of Elliotts resided there. He was named after two relatives and is the youngest of three boys. His parents were Erving "George" Elliott Jr. (1924-1998) and Mildred Reece (1921-1991) His father George created a lumber company and loved racing, and later created a speed shop where Bill's brothers, Ernie (born 1947) and Dan (born 1951), worked. His father was also a Ford person and later created a Ford dealership as there were not any in the area. Elliott has three children, two daughters, Lauren Starr and Brittany, and one son, William Clyde II (nicknamed "Chase"). The 2014 NASCAR Nationwide Series champion, Chase Elliott currently competes in the Cup Series for Hendrick Motorsports. Brittany Elliott joined the Air Force in Security Forces. Driving a car owned by his father, George Elliott, Elliott made his first Winston Cup Series start at Rockingham in 1976. He qualified 34th in a field of 36 cars; Elliott only lasted 32 laps that day before the oil pump failed in his Ford Torino, earning him $640. Elliott toiled for five years in the Winston Cup Series without corporate sponsorship, and along the way showed flashes that he could compete with the established veterans of the sport. In mid-1977, Elliott bought a Mercury Montego from Bobby Allison after his split from Penske Racing to replace the inferior Torino, and the move paid off. He soon earned his first Top 10 finish in the Southern 500 (10th), and his first top-5 finish 2 years later in the same race, finishing second to race winner (and Elliott's boyhood hero) David Pearson. In the fall of 1980, Elliott gained his first major sponsor in the form of $500 from Harry Melling of Melling Racing in the 1980 National 500 at Charlotte. Melling would extend his contract and gave the team enough sponsorship to run a 12 race schedule in 1981. In the 1981 season, he had one Top 5 and seven Top 10 finishes in 13 races, including the team's first pole in the CRC Chemicals Rebel 500. Melling bought the team from Elliott's father George on December 1, 1981. In 1983, Elliott won his first Winston Cup race in the final race of the season — the Winston Western 500 at Riverside. Elliott also finished second four times including the Daytona 500 on his way to a third-place finish in the championship point standings that season. He gained full sponsorship from Coors in 1984 to the tune of $400,000 and won three races – the Michigan 400, the Miller High Life 500, and the American 500. He also collected four poles and finished third in the final points standings for the second time. The 1985 season was undoubtedly the best season of Bill Elliott's career. He scored 11 wins and 11 poles out of 28 races and also won the first Winston Million in the Southern 500 at Darlington. This would give him the nickname "Million Dollar Bill" and "Awesome Bill From Dawsonville". The only major of the four he did not win was the Coca-Cola 600 (a driver needed only to win a "small slam" of the four majors to win the bonus; Elliott, since he retired in 2013, would not finish a Career Grand Slam). This allowed him to become the second NASCAR driver to be featured on the cover of Sports Illustrated, following Cale Yarborough after his win in the 1977 Daytona 500. Elliott finished second in the championship point standings by 101 points, losing the Winston Cup Championship to Darrell Waltrip after a string of poor finishes in the last quarter of the season. Elliott would set an unprecedented NASCAR record of winning five consecutive pole qualifying sessions in 1985; the June Pocono race, the Firecracker 400, the July races in Pocono and Talladega, and the August Michigan race. That did not include the June Michigan race where qualifying was rained out, and the July Pocono race pole was where he started second, but further investigation led NASCAR to throw out the winning pole time for illegal fuel additives, retroactively awarding Elliott the pole award, money, and credit towards the season-long award for most poles won. Elliott also set a NASCAR modern era record in 1985 for completing the season sweep at 4 different tracks in one season: Pocono, Michigan, Darlington, and Atlanta. In 1986, Elliott won only 2 races, both being the Michigan races. With the season sweep at Michigan, Elliott became the first driver in NASCAR history to win 4 straight superspeedway races at one track. He also won four poles during the season, and he finished fourth in the championship standings. He also won The 1986 Winston, held at Atlanta, the only year the race was run somewhere other than Charlotte. He won six races the next season, including his second Daytona 500, and the Talladega 500, seven poles, and finished second in the final point standings to Dale Earnhardt by 489 points. In The 1987 Winston, he tangled with Earnhardt in what has become known as "the Pass In The Grass". However, Elliott's most lasting accomplishment that year was setting two NASCAR qualifying records, which stand to this day. At Daytona, he set the NASCAR speed record with an average speed of 210.364 miles per hour (338.548 km/h). He broke his own record at Talladega with an average speed of 212.809 miles per hour (342.483 km/h); the previous record he set in 1986 was 209.383 miles per hour (336.969 km/h). In both races, he used a Ford Thunderbird which contained an engine built by his brother Ernie. However, at Talladega, Bobby Allison was spun and went airborne into the catch fence, tearing a large section away and injuring several fans. After this incident, NASCAR mandated the use of restrictor plates at Daytona and Talladega. As a result, Elliott's speed records will likely never be broken. In 1988 Elliott won another six races, including the Southern 500 and the Pepsi Firecracker 400, six poles, and his first and only Winston Cup Championship. Following his championship season, Elliott broke his wrist in a crash during testing at Daytona and required relief by Jody Ridley during several races in the first part of the 1989 season. Elliott won two poles and three races and finished sixth in the championship standings. In 1990, Elliott won one race and two poles and finished fourth in the championship standings. In the 1990 race at Atlanta, Elliott's rear tire changer Mike Rich was killed when Ricky Rudd lost control of his car, spun, and slammed the crew member between his car and Elliott's. As a result, NASCAR restricted the cars' speed on pit road. The 1991 season saw Elliott's sponsorship change to Coors Light and the familiar red on the car was replaced with blue. Elliott would only win once that year in the Pepsi 400 and won two poles. After a year of struggle, Elliott finished a disappointing eleventh in the championship standings, causing him and Coors to part ways with Mellings. That lone win in 1991 would be the only time in his career that Bill Elliott won in a car that was NOT painted red. Overall, in 9 seasons, Melling Racing set several NASCAR records, winning the Winston Million, winning the Winston Cup Championship, and won a total of 34 career races, all of these accomplishments with only Bill Elliott. The success of Melling Racing may have come to an end after Elliott left at the end of 1991, but Elliott would be more successful in the years to come. Elliott left Melling to join Junior Johnson & Associates in 1992, replacing Geoffrey Bodine in the No. 11 Budweiser Ford. In 1992, Elliott won five races (including four in a row) and three poles, but much like his 1985 season he finished a disappointing second in the championship standings after squandering a large lead in the standings with a late season string of poor finishes. He did win the season finale at his home track in Atlanta, but lost the championship by 10 points to Alan Kulwicki, who finished in second place and had led the most laps by one over Elliott. Had Kulwicki not led the most laps, Elliott would have finished tied with him for the lead and would have been awarded the title on a tiebreaker due to him having more wins (as Elliott had won three more times than Kulwicki). Elliott went winless in 1993 and finished eighth in the standings. He scored just one win the following season in the 1994 Southern 500 while finishing 10th in the championship standings. After his Darlington victory, Elliott announced he would be starting his own team with sponsorship from McDonald's in 1995. After leaving Johnson's team, Elliott fielded his own Winston Cup race team from 1995 to 2000. He used the No. 94 in honor of his nephew, Casey Elliott, who was battling cancer at the time he formed the team and would die in 1996. The team also fielded entries in the Busch Series and Truck Series. Elliott failed to win a race during this time, though he did manage two top ten finishes in the championship standings, with an eighth place in 1995 and 1997. In 1996, Elliott missed five races to recover from injuring a broken hip at Talladega and was replaced by Dorsey Schroeder and Todd Bodine. In July 1996, the partnership between Elliott and Hardy was dissolved, the team being renamed Bill Elliott Racing. Later in the 1996, Elliott suffered effects after an accident at Talladega earlier in the year and, Elliott missed two races and was replaced by Tommy Kendall and Bobby Hillin, Jr.. He did manage a two top ten finishes in the championship standings, with an eighth-place finish in 1997. After a disappointing 1999 season which saw Elliott's multi-car operation dissolve back into No. 94, Elliott announced in early 2000 he was selling his equipment to championship-winning crew chief Ray Evernham to become part of Dodge's return to NASCAR. The team would also switch to No. 9, which was owned by Melling, his championship winning team. Even though he struggled the entire 6 years as a driver/owner and not winning a single race, Elliott's fans still voted him as NASCAR's Most Popular Driver. He would hold the record for 10 straight years as a most popular driver from 1991 to 2000, a record that would stand until 2013, when Dale Earnhardt, Jr. would win his 11th straight award. Earnhardt would win the award for 15 straight years from 2003 to 2017, a NASCAR record. In 1998 Elliott teamed up with Dan Marino to form a multi car team, the team was renamed Elliott-Marino Motorsports, adding the No. 13 and keeping the No. 94, Marino owned the No. 13 while Elliott owned the No. 94. The year was marked with sadness for Elliott when he had to miss the fall Dover race to attend the funeral of his father. Matt Kenseth drove Elliott's No. 94 and finished 6th in his Cup debut. In 2000, Elliott sold his team to Ray Evernham and began driving the No. 9 Dodge Dealers/UAW-sponsored Dodge Intrepid the following year. Ironically, Melling Racing, who ran the No. 9 for Bill Elliott from 1981 to 1991, yielded that number to Ray Evernham for 2001. Elliott asked Evernham to drive that number out of respect for his old team. Elliott and Evernham however found success in its very first race in the No. 9 Dodge, as Elliott won the pole for the 2001 Daytona 500. It would also be the 50th pole of his career. By winning the pole, Bill Elliott would become the first, and as of 2018, the only driver in NASCAR history to score his 50th career pole in the Daytona 500. He would finish the race in the Top 5, bringing home a 5th-place finish, though the race will forever be remembered for the death of fan favorite Dale Earnhardt. Elliott finished his first season with Evernham Motorsports with two poles, five Top 5s, and nine Top 10 finishes, and one win at the Pennzoil Freedom 400 at Homestead from the pole. This was his first win since the Southern 500 in 1994, 7 years and 226 races. As of 2018, the 226 race winless streak is the longest drought in NASCAR history. However, after Melling yielded the No. 9 for 2001, Bill Elliott would win at Homestead driving that number, but this time, with Evernham Motorsports. In another ironic twist, Elliott winning at Homestead would be first time since Melling Racing and Bill Elliott himself at the Pepsi 400 in 1991, that the No. 9 went to victory lane. Elliott finished 15th in the final points standings for 2001. Elliott also withdrew from the ballot as NASCAR's Most Popular Driver, and encouraged his long time fans to vote for his friend and long time rival Dale Earnhardt. Earnhardt was posthumously voted as NASCAR's Most Popular Driver for 2001. In 2002, he won four poles and went to victory lane twice; those wins included the Pennsylvania 500 and one of the most dominant victories in the history of the Brickyard 400 at Indianapolis Motor Speedway a week later He finished 13th in the final points standings. 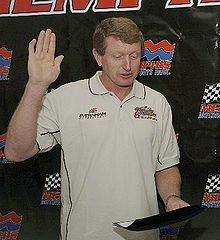 For the 16th and final time in his career, Bill Elliott was voted as NASCAR's Most Popular Driver. His last win, in what became his final full-time season, came in 2003 at Rockingham. A week later, Elliott came within a lap of winning his final race as a full-time driver (he would have been the only retiring driver to do so) in the 2003 Ford 400 at Homestead-Miami Speedway. Elliott led 189 of 267 laps and was on his way to victory, but a cut tire on the final lap allowed Bobby Labonte to score the victory (his last and most recent win to date). He still finished the race and maintained his ninth-place position in the final points standings, his best points finish since finished eighth in the 1997 standings. Elliott officially withdrew from the ballot as NASCAR's Most Popular Driver, giving the award to Dale Earnhardt, Jr., who would go on to win for 15 straight years from 2003 to 2017, a NASCAR record. A few weeks later after the 2003 season ended, Elliott announced that he was relinquishing the No. 9 car to Kasey Kahne and switching to a part-time schedule driving R&D cars for Evernham. In 2004, Elliott drove the No. 91 Dodge Intrepid for Evernham in three events (along with the Budweiser Shootout) he only made three starts during his first part-time season with Evernham, he still managed to have some success which included a ninth-place finish at Indianapolis and second and third-place qualifying efforts at Texas. He also brought back the Bill Elliott Racing moniker when he drove the 98 car twice in 2004, one with Coke C2 Sponsorship and one with McDonald's. The reason being that Evernham fielded cars with sponsorship with PepsiCo's Mountain Dew. In 2005, Elliott continued his part-time driving duties which included driving the No. 39 Coors Dodge Charger (in a paint scheme reminiscent of his 1987 Coors Light Ford) for Chip Ganassi Racing in the Budweiser Shootout and the No. 91 Evernham Dodge in several events. Although he made three more starts than the previous season, he did not have the same amount of success. He managed to get an eleventh-place finish and a tenth-place qualifying effort at Michigan, along with a ninth-place qualifying effort at Texas. He also competed in select NASCAR Busch Series events for Rusty Wallace and also drove the No. 6 Unilever Dodge Charger in the Busch Series for Evernham at Memphis, which celebrated the 40th anniversary of A Charlie Brown Christmas. For the 2006 season, the 2005 owners' points for the No. 91 team went to the new No. 10 Evernham team and driver Scott Riggs and the 91 team was discontinued. On August 8, 2006, Evernham Motorsports announced that Elliott would return to the organization for the race at Watkins Glen driving the No. 19 Dodge previously driven by Jeremy Mayfield. The team fell out of the top-35 in owners' points after Indianapolis, leading to the firing of Mayfield, and Evernham assumed that Elliott would guarantee a starting spot in the field by being a past champion. However, since the driver switch was made past the entry deadline, NASCAR said that Elliott was not eligible for the past champions provisional. Elliott also drove the No. 98 Dodge Intrepid for Mach 1 Racing in three other events in 2004 because of sponsorship issues between Coca-Cola (Elliott's sponsor) and Pepsi (Evernham's sponsor). but Evernham leased the car to him. Although he only made three starts during his first part-time season as an driver, he still managed to have some success which included a third-place qualifying efforts at California respectively. On January 4, 2006, Elliott announced that he would pilot the No. 36 Chevrolet Monte Carlo SS for Ginn Racing in the 2006 Daytona Speedweeks events. This included the Budweiser Shootout, the Gatorade Duel, and the Daytona 500, which Elliott had not competed in since 2003. On March 17, 2006, it was announced that Elliott would drive the No. 00 Burger King Chevrolet for Michael Waltrip Racing in five NEXTEL Cup events which included Chicagoland, New Hampshire, Indianapolis, California, and Homestead. For the race at Kansas, Elliott teamed up with R&J Racing to drive the No. 37 Dodge. Elliott finished a season-high 16th at the Banquet 400 at Kansas, but did not qualify for the Bank of America 500 at Charlotte two weeks later. Elliott was scheduled to be the Team Red Bull entry for Atlanta, but A. J. Allmendinger drove the car instead, Elliott instead drove the No. 37 Dodge at Atlanta, marking the 30th Anniversary of Elliott driving at his hometown track. Elliott attempted to qualify for the 2007 Daytona 500, but failed to make the race in the No. 37. Later that season, Elliott signed to drive the No. 21 for Wood Brothers Racing in 2007, in part due to his championship provisional, which guaranteed starting the race. Since fellow champion Dale Jarrett had used all of his guaranteed starts in his Toyota for Michael Waltrip Racing, Elliott was the only champion eligible for the provisional not guaranteed a spot by being in the top 35 in owner's points. His first race for the team was the Coca Cola 600 at Charlotte, which he qualified without needing one of his six provisionals. He led the race at one point until he was involved in a wreck around lap 200. At Michigan, Elliott gave the team a much needed 11th-place finish, and was kept in the car until the fall Richmond race. The car then fell out of the top 35 again but at Bristol got back into top 35 in points. Ken Schrader returned to the No. 21 replacing Elliott at a testing session at Talladega Superspeedway due to the team being back in the top 35 in owners points. He returned for the final four races after the 21 fell out of the top-35 once again. On September 23, 2007, in an interview with Charlotte Observer Len Wood the co- owner of the No. 21 said in 2008 Elliott would have his own sponsor and share ride with Jon Wood and Marcos Ambrose. Bill Elliott returned to the No. 21 to try to get the car back into the Top 35 points at Lowes Motor Speedway. Elliott has qualified for ten races this season, with a best finish of 20th in the Sunoco Presents: The American Red Cross Pennsylvania 500 at Pocono Raceway. At Daytona Elliott announced that 2008 will be his final season as a Sprint Cup driver. But at Kansas in an interview on NASCAR Raceday, Elliott was asked about him racing, and said "We will be at Lowe's, and do a few more races. Then we will see how things go." Bill in 2008, best starts were 5th at Bristol and 7th at Kansas. His best finish was 12th at Homestead-Miami Speedway. In 2009, Elliott ran 12 races in the No. 21 Motorcraft Ford for the Wood Brothers, including the Daytona 500. His best finish in 2009 was 15th place at Lowe's Motor Speedway. On Memorial Day May 25, 2009, Elliott became the 7th member of the "800 club", with his 800th career Sprint Cup start at Lowes Motor Speedway. Elliott ran for the Wood Brothers in 2010. He also drove at Talladega for Latitude 43 Motorsports. In 2011, Elliott did not return to Wood Brothers Racing, but ran 4 races for Phoenix Racing in the No. 09 Chevy. Bill stepped out of the ride to assist his son Chase Elliott in the K&N Pro Series East. Landon Cassill would take over the car for the fifth race of the season, which was eventually renumbered to No. 51. Elliott was entered as the driver of the No. 46 Red Line Oil Chevrolet for Whitney Motorsports at Talladega but J.J. Yeley would finish the race. For the 2012 season, Elliott joined Joe Nemechek at NEMCO Motorsports to drive the No. 97 Toyota in the 2012 Daytona 500, but failed to qualify for the race. Elliott successfully qualified for the Sprint Cup race at Talladega driving the 97, but finished in 37th. Elliott made his third start of the 2012 season driving for Turner Motorsports in the July race at Daytona International Speedway, in the No. 50 Walmart-sponsored Chevrolet. Elliott qualified 5th, and ran in the top 10 throughout the first half of the race, but finished 37th after being involved in an accident. This was his 828th and final start in the NASCAR Sprint Cup Series. On August 4, 2018, GMS Racing announced that Elliott would return to NASCAR, driving the No. 23 Chevrolet Camaro at Road America in the Xfinity Series on August 25. It was Elliott's first Xfinity start since 2005 and first National Series start since 2012. He finished in 20th on the lead lap. After the race, he quipped "I feel like I hit everything but the lottery, I mean it was a great day." In 1990, Konami released the first officially licensed NASCAR game, Bill Elliott's NASCAR Challenge for MS-DOS. The game was released for the NES and Amiga in 1991, and Bill Elliott's NASCAR Fast Tracks was released for the Game Boy at the same time. ^ a b "Bill Elliott – NASCAR – Yahoo Sports". Yahoo! Sports. Retrieved October 24, 2015. ^ "Rathmann, Elliott lead way". The Indianapolis Star. February 20, 2007. Archived from the original on 2015-09-24. Retrieved 2018-11-07. ^ Elliott, Bill; Millard, Chris (2009). Awesome Bill from Dawsonville: Looking Back on a Life in NASCAR. New York City, United States: HarperCollins. ISBN 978-0-06-173849-4. ^ "It's official: Chase Elliott to replace Jeff Gordon in No. 24 Hendrick Motorsports Chevy". Foxsports.com. January 29, 2015. Retrieved January 29, 2015. ^ Reusse, Patrick (February 17, 2001). "Elliott content doing business in a Dodge". Pittsburgh Post-Gazette. Pittsburgh, PA. p. C1. Retrieved 2013-09-15. ^ "Bill Elliott". The Crittenden Automotive Library. Archived from the original on 15 May 2007. Retrieved May 8, 2007. ^ Jayski's notes on Pole Winners. ^ "Alan Kulwicki". NASCAR.com. April 4, 2003. Archived from the original on 6 August 2007. Retrieved 2007-07-04. ^ "Dominance underscores winning performance". Elizabethan Star Online Edition. Archived from the original on 2013-10-21. ^ https://www.nytimes.com/2007/05/26/sports/othersports/26nascar.html?scp=19&sq=%22bill+elliott%22&st=nyt – "Elliott drove the No. 37 Dodge in the preseason Bud Shootout at Daytona International Speedway in February but failed to qualify for the Daytona 500 because another driver, Dale Jarrett, had priority in using an exemption and he took the final guaranteed spot." ^ a b Bernstein, Viv (May 26, 2007). "In Nascar, Two Old Hands Reach Out for Some Help". The New York Times. Retrieved April 26, 2010. ^ "Bill Elliott To Drive No. 97 Toyota In Daytona 500". SPEED Channel. Fox Sports. February 15, 2012. Archived from the original on 2012-02-18. Retrieved 2012-02-16. ^ "Matt Kenseth Wins 2nd Daytona Qualifying Race, Bill Elliott Fails To Qualify For 500". WMGT-DT. Macon, Georgia. February 23, 2012. Archived from the original on 2012-02-26. Retrieved 2012-02-24. ^ Vivlamore, Chris (January 26, 2012). "Elliott to drive one more race". Atlanta Journal-Constitution. Atlanta, Georgia. Retrieved 2012-01-26. ^ "Hall of Famer Bill Elliott to make shock NASCAR return". Motorsport.com. August 4, 2018. Retrieved 2018-08-05. ^ a b c Engle, Greg. "NASCAR legend Bill Elliott hits 'everything but the lottery' at Road America". Autoweek. Retrieved August 26, 2018. ^ "Bill Elliott – 1986 IROC Results". Racing-Reference. Retrieved December 26, 2017. ^ "Bill Elliott – 1987 IROC Results". Racing-Reference. Retrieved December 26, 2017. ^ "Bill Elliott – 1988 IROC Results". Racing-Reference. Retrieved December 26, 2017. ^ "Bill Elliott – 1989 IROC Results". Racing-Reference. Retrieved December 26, 2017. ^ "Bill Elliott – 1991 IROC Results". Racing-Reference. Retrieved December 26, 2017. ^ "Bill Elliott – 1993 IROC Results". Racing-Reference. Retrieved December 26, 2017. Wikimedia Commons has media related to Bill Elliott.